In an earlier posting, I described the "moving" black spot that's often seen in the eyes of insects, such as this mantis. 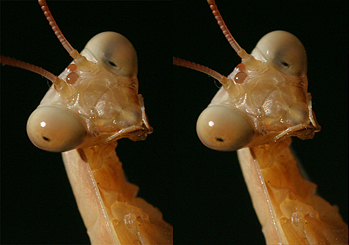 When seen in motion (image #1, or in stereo (image #2), the black spot appears to be deep inside the eye, maybe even beyond it. Under a stereo microscope, the effect is compelling. I could not capture it perfectly in these photographs, but perhaps you will get the idea. The second picture can be viewed larger here. A particularly good viewer is StereoPhoto Maker, which allows to zoom and pan interactively, and also to switch quickly between parallel and crossed-eye viewing, whichever you find more convenient. Technical: Canon 300D, Sigma 105mm at 1:1, cropped. Natural lighting, subject in full sun against shaded background, f/11. Finished in Photoshop and Image Ready.